1. Which application do I complete UHC or PC&TC? 2. Where do I access and submit completed applications and transcripts? 3. Do my transcripts and ACT/SAT scores have to be official copies? All academic transcripts and test scores must be official, signed and sealed copies. 4. Is there a minimum ACT or SAT score for admission into the program? *Alternative pathways to admission may exist for applicants with Math and English ACT subsection scores that are below the required minimums. **There is no alternative pathway to admission for ACT composite scores below 19. Additional admission points are also awarded based upon the ACT subsection score in Science, but there is no minimum score requirement. 5. If I already have a college degree, do I need to enroll through Pierpont Community and Technical College? 6. Is it necessary to take college classes while I am enrolled in the radiologic technology program at UHC? College courses completed as Dual Enrollment courses while in high school may be applied to satisfy the general education requirements. Transfer credit for courses taken at another college or university is at the discretion of the PC&TC registrar. 7. How do you select students for admission? Student selection is a two-part process that begins with a review of student required academic transcripts. These must be submitted by January 31st of the year in which the individual wants to be admitted. An impartial scoring system is used to rank applicants on the basis of performance on the ACT or SAT test and in the following recommended prerequisite courses – Biology, Chemistry, Physics, Anatomy/Physiology, Computer Science and Algebra. Admission points are earned for advanced math and science courses taken in high school and/or college with credit awarded based upon the grade point average. Lesser amount of credit is available for courses taken through business colleges or technical programs. Interviews are scheduled in March for candidates with academic scores in the upper percentile. All candidates receive notification by mail about whether they will or will not receive further consideration in the interview process. A maximum of fifteen students are selected following interviews and begin required pre-admission testing for program entry in June. Additional candidates are ranked as alternates and are notified by mail in the event that a student position becomes available prior to the program start date. 8. Can I apply the WV Promise Scholarship or other sources of financial aid to offset my costs of attendance? 9. What are the total costs of attendance for the radiologic technology program? Students are required to wear scrub outfits of a specific color and style number; the total cost for uniforms will vary by quantity, but rarely exceeds $200. The required student textbooks for the first year cost approximately $600; additional textbooks needed for the second year may cost approximately $300 and are purchased during the final quarter of the first year. Room and board are the student’s responsibility during the 24 month training program. United Hospital Center School of Radiologic Technology charges a tuition of $6000 for students that already have achieved a minimum of an Associate’s Degree and are applying directly to the hospital. This may be paid in quarterly installments of $750. Students that enroll through Pierpont Community and Technical College (PC&TC) pay the current full-time tuition and fees for two years. Please contact PC&TC for further information at 304-367-4907 ext. 1 or www. pierpont.edu. 10. Can I have a full- or part-time job while I am enrolled in the program? United Hospital Center and its clinical affiliates may employ radiography students in capacities other than for the performance of radiologic procedures, but do so independently of any program affiliation. The School of Radiologic Technology supports the intent of WV Code 30-23, “to ensure minimum standards of education, training and experience for radiologic technologists”. With respect to the WV Code, UHC School of Radiologic Technology neither endorses nor discourages students who seek employment during their involvement with the training program. Clinical and didactic schedules related to the training program WILL NOT be altered by the demands of such employment. 11. Do you wait list individuals that apply, but don’t get in? 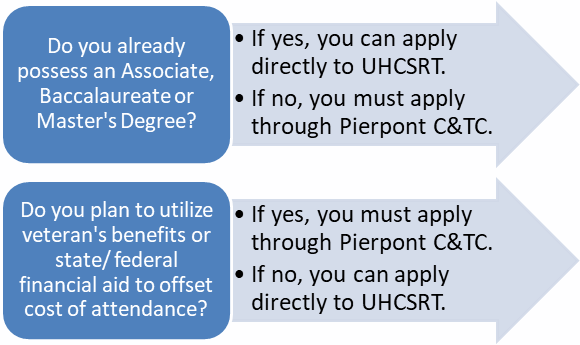 UHC School of Radiologic Technology does NOT waitlist candidates or offer deferred admission. Candidates choosing to reapply must complete and submit a new application form and update all academic records. Applications are accepted by United Hospital Center and Pierpont Community and Technical College prior to January 31 of the year in which you hope to enter the training program. 12. Will job placement services be available to me when I complete the program? Radiologic technologists are employed wherever medical images are needed – large medical centers, smaller community hospitals, independent imaging centers, urgent care facilities and physician offices. Opportunities abound in education, administration and industry. Students and graduates enrolled through Pierpont Community and Technical College may access a full range of services to assist in preparing for a career or pursuing employment opportunities. Pierpont Career Link provides a platform for career exploration, resume building and employment searches. UHC School of Radiologic Technology has consistently achieved 100% employment within 6 months of graduation for those actively seeking employment opportunities. To learn more about Career Services or make appointments call 304-367-4990 or nancy.parks@pierpont.edu.